Recently I splurged and picked up my first bag of Cup4Cup. If you’ve ever attempted gluten-free baking, it generally requires at least 3 different types of flours. Even an all-purpose variety requires the addition of some xanthan gum. Cup4Cup does all the scientific work for you, boasting a perfect substitute in almost any glutenous recipe. For an average of $18 for a 3-pound bag, the claim better be true. Skimming though Manu’s dessert recipes, I found myself bypassing the fancier recipes for something more basic. It had been months since I had a decent chocolate chip cookie. I immediately latched on to her White Chocolate Macadamia Nut Cookies. Then I saw her Coconut Cookies. Maybe it was the promise of spring and warm weather, or the fact that I had just booked our trip to Hawaii (still so many months off…) but I wanted something tropical. Too hard to choose between the two, I did the next best thing: merged them. Cup4Cup lived up to its claim. For these cookies at least. The flour adds extra elasticity to a dough so while the cookies worked out just fine (a little dough flattening was required), an earlier attempt at pancakes that day wasn’t nearly as successful. But the important part I had delicious, homemade cookies. I suggest doubling the recipes–these go fast! Preheat oven to 350F. In a small bowl, mix together flour, baking powder and salt. Set aside. In the bowl of standing, cream butter, sugar and vanilla. Add eggs, one at a time, until just combined. Add flour mixture in two parts until fully mixed. Stir in coconut, chocolate chips and macadamia nuts. Drop heaping tablespoons of dough onto a parchment lined baking sheet, and flatten each ball slightly. Bake for 15-20 minutes until golden brown. Love macadamia nuts! I haven’t had them in ages! These cookies look awesome! 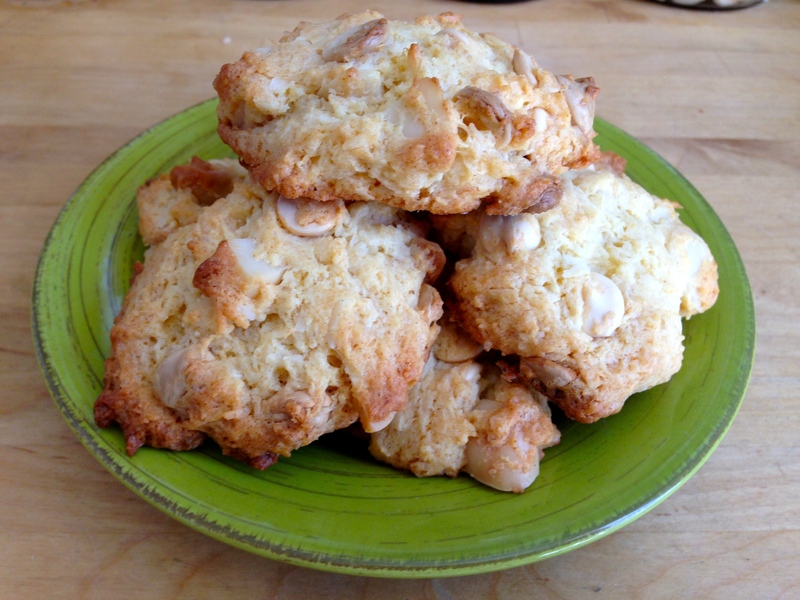 My family loves white chocolate macadamia cookies, I bet they would be even better with coconut! The coconut adds some texture and just a bit more of a tropical feel. Definitely try! Love the combination of these cookies! Happy SRC day! Coconut and white chocolate? Oh how good these must of been. And lucky you for getting to go to Hawaii! That is my dream vacation. Happy reveal day! Cup4Cup? Never heard of it but I will look for it. We’re always looking for good gluten free cookies and love the idea of coconut, white chocolate and macadamia nuts! It’s supposedly a careful design by chefs and endorsed by Martha Stewart. I have to admit, the flour feel is a bit strange. It feels more like cornstarch and has a good bit of the stuff in it, but the cookies turned out lovely. My favorite kind of cookie! Love the GF factor! Thanks! I tried to pass them by some glutenous friends–no one noticed the difference! Not very confident when it comes to gluten free baking, but this looks wonderful (especially since you don’t have to try to work with xanthum gum or whatever). I would give these a shot. Great SRC post! The Cup4Cup flour isn’t cheap, and doesn’t seem to really be an ALL all purpose flour, but for baking, it’s totally worth it.